She made the recipe work without processing the vegetables and leaving out the sour cream, using roux instead. 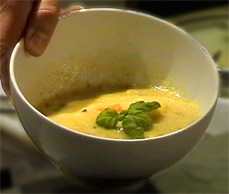 She prepared this soup on a regular basis, which is no wonder, as it is done in no time and tastes fabulous. (Nearly) all you will need for it, is what you're certain to always have at home. The cream soup variety requires sour cream and fresh coriander (a herb I do not particularly like, but which goes very nicely here). If you don't have any or it doesn't agree with you, you can easily replace it with parsley. Wash and/or peel the vegetables and dice into cubes. Lightly sauté the leek and onions. Deglaze with white wine and add the remaining vegetables. Add water. Season with caraway seeds and salt. Simmer for 30 minutes, until the potatoes begin to fall apart. Remove half of the vegetables with a slotted spoon and using a blender or food processor, purée the remainder until smooth. Return vegetables to saucepan.